A common statement we hear from our patients is "Our previous Retinologist or Ophthalmologist said that there was nothing further that can be done.” This is a common misconception! Low Vision Optometry is a highly technical area of optometry which requires extensive training and education. Members of The IALVS have spent years developing advanced solutions which maximize the usefulness and effectiveness of remaining vision. Your Ophthalmologist or Retinologist is focused on the medical aspect of your eye condition. While not all patients can be helped with Low Vision aids, most patients that we fit with custom optics or other Low Vision devices experience a profound improvement in their everyday quality of life. One of the hardest realities of living with low vision is the need to constantly rely on others. Transitioning to a lifestyle of dependency is traumatic both for the person with low vision, as well as their families. Many times the spouse or child will be left to run errands, drive the patient around, cook and clean and much more. Low vision aids may give the patient the freedom to perform the tasks they need and regain their self-sufficiency. 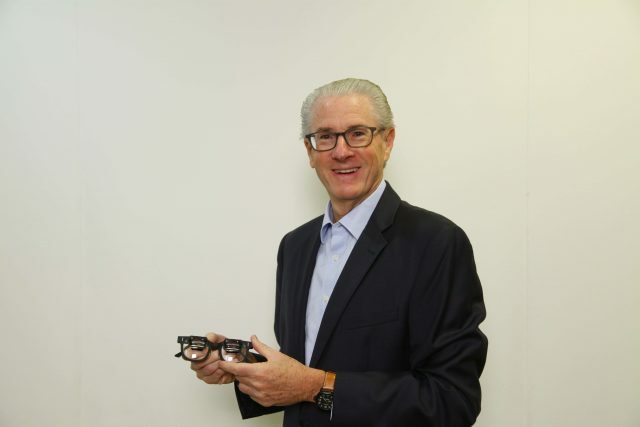 Our low vision optometrist, Dr. Mark Rinkov, is a member of the International Academy Of Low Vision Specialists, a professional organization dedicated to enabling low vision patients access to the optical and digital technology that will transform their life. Dr. Mark Rinkov is passionate about low vision care and making a difference in our communities. Low Vision is a condition, whether caused by eye disease, genetics, trauma, or other events, where fully corrected vision with conventional glasses, contact lenses or refractive surgery, remains insufficient to do what you want to do. Some consider low vision to be less than 20/40 vision. Others consider it to be less than 20/70 vision. However, The International Academy of Low Vision Specialists (IALVS) believes that the inability to see well enough to do those tasks you want to continue doing, even with your best glasses (contacts or refractive surgery) is sufficient reason to seek the help of a low vision optometrist. The burden of such a sudden loss of independence means that Low Vision not only robs the patient of functional capability, it also leaves the patient mentally and emotionally devastated. While commonly associated with seniors over the age of 60, Low Vision also affects children and adults of all ages. Age-Related Macular Degeneration is the most common cause for Low Vision in the US, however patients from all over Ohio visit for Low Vision care for a wide variety of conditions and diseases. What Is A Low Vision Exam? During your low vision eye exam, Dr. Mark Rinkov will determine your level of vision, see if new regular glasses will be an improvement, discuss your wish list and help decide the best solution to help you regain as much day to day functioning as possible. View Our Success Stories & Testimonials. Our patients are often moved to tears when they can get back to doing the things they love. 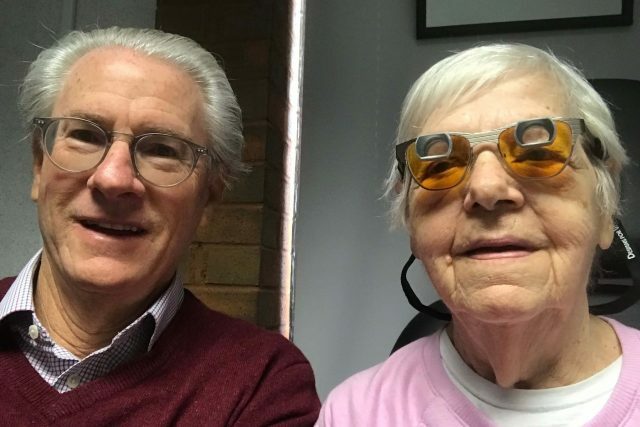 We have shared some of our patient's experiences in order to show the dramatic life-changing nature of low vision care. When Should I Visit A Low Vision Optometrist? A Low Vision Eye Exam should be conducted as soon as you have received a diagnosis of an eye disease or condition that could lead to Low Vision. A Low Vision optometrist stays up to date on the latest research in slowing down the progression of vision loss, so it is essential to book a Low Vision exam right away. Most of our patients visit us after years of struggling with severe vision loss. If you or a loved one have a visual impairment, call our Low Vision doctor for a free phone consultation to understand how you may be helped. If you are in doubt our Worthington low vision optometrist can help, we encourage you to call and Dr. Mark Rinkov will be happy to discuss your concerns on the phone. 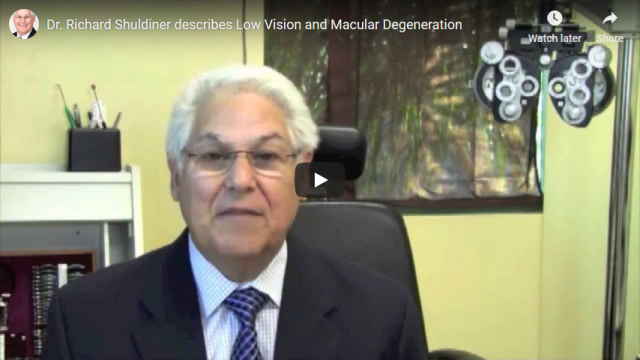 How Can A Low Vision Optometrist Help? A low vision optometrist fits custom vision aids and devices, which allow the Low Vision patient to maximize the use of their remaining vision in the most effective way possible. This allows someone suffering from Low Vision to regain their ability to perform everyday tasks, as well as their independence and human dignity. For example, A 65-year-old patient with Macular Degeneration wanted to be able to go shopping and visit people without feeling like a burden on others. 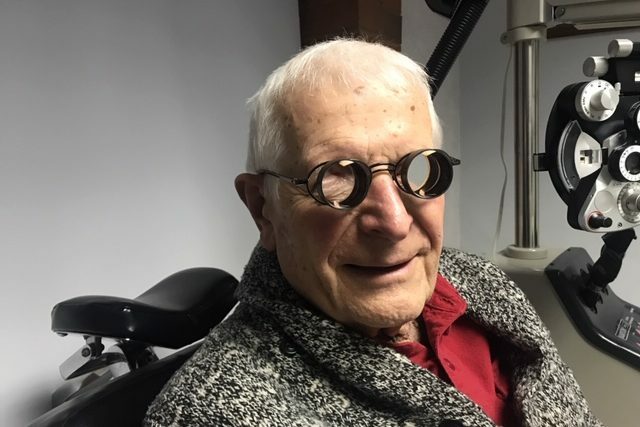 Our Low Vision optometrist, Dr. Mark Rinkov, custom designed bioptic telescope glasses that enabled the patient to drive, read, and go shopping once again, without needing the help of others. Driving rules are complex and constantly changing. We have helped low vision patients from all over Ohio regain their independence and drive again with bioptic telescope glasses. Our Low Vision Optometrist, Dr. Mark Rinkov, helps patients from all over Ohio, with eye diseases such as macular degeneration, glaucoma, diabetic retinopathy, retinitis pigmentosa, cataracts, vision issues related to albinism, and more, to maximize their remaining vision to its full potential in order to recover and save vision functionality. This is done with the help of highly specialized Low Vision optics/glasses and other vision aids that help patients regain their independence. Dr. Mark Rinkov, our Low Vision eye doctor, is passionate about helping people in Ohio recover their day to day functioning. Too many patients leave their ophthalmologist or retinologist thinking there is nothing left to be done but manage the disease to prevent further vision loss. 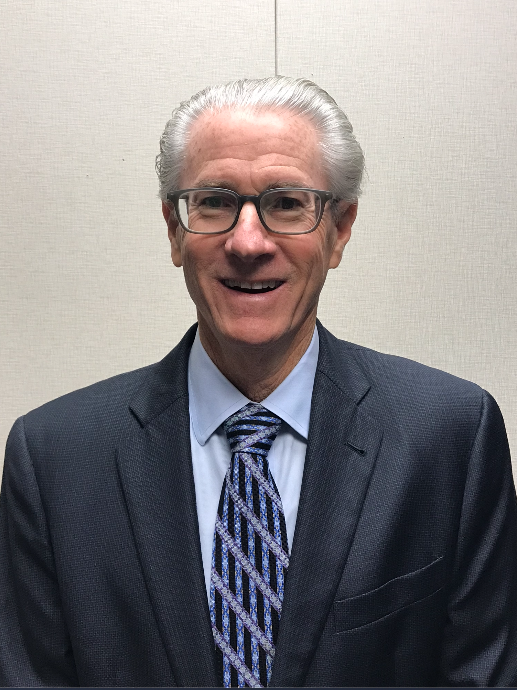 Dr. Mark Rinkov is a member of the International Academy Of Low Vision Specialists (IALVS), the premier organization of Low Vision Optometrists. All members of IALVS receive extensive training to learn how to help patients with vision loss maximize their remaining vision using the latest devices and technology. For many people, proper use of a Low Vision device means being able to read, drive, sew, play cards, watch television, and use the computer—all of which would be impossible without these Low Vision Aids. At the Low Vision Doctors of Ohio, we help patients from Worthington, Columbus, , and to enjoy life after vision loss with Low Vision Aids. A Low Vision aid is any tool or device that can help a person with vision loss perform the tasks that they most want to be able to perform. The treatment for Low Vision has changed drastically with new technologies which have revolutionized Low Vision and resulted in far more effective tools to regain vision function. There have been major improvements in the optical design and construction of Low Vision telescopes, microscope glasses, filters, and prisms. Furthermore, a range of digital devices have been developed which can significantly boost the ability of a Low Vision sufferer to function. These include IRISVISION, ORCAM, ESIGHT and CCTV stands, as well as portable digital magnifiers. 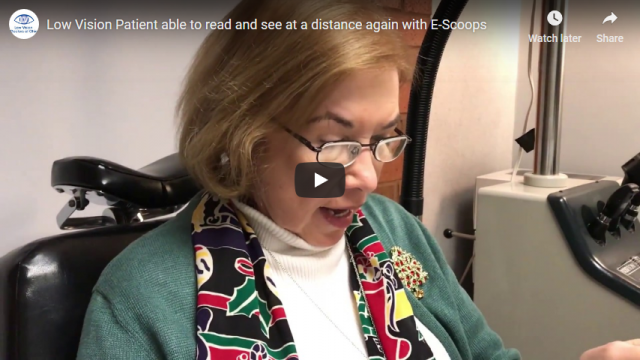 To learn more about the different low vision aids, devices, magnifiers, and glasses. Because of the large range of options, it is crucial to speak with a Low Vision optometrist who will help you navigate the options and find the option that will give you the best solution to your specific needs. Low Vision Doctors of Ohio is the preferred provider of Low Vision aids for patients from Worthington, Columbus, , and . One of the most important Low Vision tools in our arsenal is Telescope Glasses. Dr. Mark Rinkov fits various custom designed full diameter, bioptic and reading telescopic glasses. Low Vision telescope, microscope, prism and filter glasses are custom designed with the patients refractive prescription for best acuity. They are tailor-made for the specific tasks on the patients wish list. These types of glasses have helped thousands of low vision patients regain their independence and improve their quality of life. From driving to playing poker, pleasure reading to doing accounting, enjoying hand work to cooking, low vision glasses have allowed a quality of life that has put smiles on many faces. Been Told There Is Nothing That Can Be Done? What Diseases Cause Low Vision? The greater the risk factor you have of developing a sight-threatening eye condition, the more important it is to have an annual eye exam. Age is the biggest risk factor for Low Vision. Other significant risk factors include diabetes, smoking, and sunlight. Early detection and appropriate intervention and care may be able to slow down or even halt vision loss. If you notice ANY of the following symptoms, schedule an eye exam immediately! Did you know that most US states allow driving with bioptic telescopes? Custom fit bioptic telescope glasses allow a driver to alternate between a normal view and a magnified view to read road signs, see traffic lights and emergencies. This is similar to using the side or rear view mirrors as needed in normal driving. Our Low Vision Doctor, Dr. Mark Rinkov, has enabled countless patients in Ohio to regain the ability to drive again. We help patients with a variety of low vision eye diseases such as Macular Degeneration, Diabetic Retinopathy, Retinitis Pigmentosa, Glaucoma, and Cataracts. Visit our low vision eye diseases page to learn more. If your father, mother, spouse or child is visually impaired, it can cause intense tension and strain at home. Your loved one suffering from Low Vision will likely be stressed, angry, or depressed about his or her condition and loss of independence. It is important to keep in mind the incredible stress that vision loss causes. As family members, you should encourage your loved ones to explore the possibilities that low vision care opens up. Members of the IALVS use demonstrator low vision glasses and devices during the low vision evaluation to show the patient how they can keep performing the desired tasks. If the patient does not want to speak with Dr. Mark Rinkov, we encourage children or spouses to talk to Dr. Mark Rinkov to discuss how we can help.